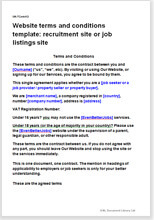 This website terms and conditions template sets out the relationship between your seekers and recruiters. It provides your business with protection in case a transaction between third parties fails, and gives you strong legal protection against malicious use of your website and misuse of your intellectual property. This T&C document has been written for the owner of a job site. It covers both usual recruitment services and whatever other services you provide to either side from your website. Is this template suitable for your website? This template is for any website that creates a marketplace primarily for recruitment, where both job seekers and recruiters interface your system entirely through your website. The same terms also cover access from a mobile device such as a smartphone. Your recruiters and seekers may be anywhere in the World. Website terms and conditions are probably the best example of a legal document where use of plain language strengthens the legal effect of the document. If a dispute should arise, it would be hard for a user of your site to claim that he did not understand, even if English is not his first language. protect your business from complaints about content that your users posted - particularly important if users can post information, questions, data and take part in discussions without you actively monitoring every post or message. The law in these T&C is largely common law that deals with the basics of contracts: offer, acceptance, price and payment, provision of service, liabilities and risk. By and large, you can set the terms you want, particularly the commercial ones. The document should be edited so that it reflects exactly how your business works. Our guidance notes will tell you what you can change safely, and what we don't advise changing. This terms and conditions template includes provisions that cover both the relationship between the recruiter and job seeker and the relationship between your business and each of them. Very extensive options as to what a user may or may not do on your website. Over 3,000 words of helpful notes to make your task even easier.